Before the American Revolution, New Englanders considered learning to be masculine and education for girls unnecessary. However, women’s contributions to the political revolution as protesters, spies, nurses, camp followers, and household and business managers led to a social revolution that not many anticipated. Americans believed that a republic depended on a virtuous and informed citizenry, which gave mothers new importance in the home and justified the existence of educational institutions for girls. Litchfield, Connecticut embodied this revolution for women in the decades following the American Revolution. Although women were not voters and had no place in the public sphere, they were tasked with developing the nation politically and intellectually from their homes or in comparable domestic institutions, particularly schools. In order to achieve such lofty outcomes, they demonstrated a new kind of social independence. Daughters who witnessed their mothers handling wartime hardships on their own grew up to choose their own spouses, participate in more egalitarian marriages, or never marry. 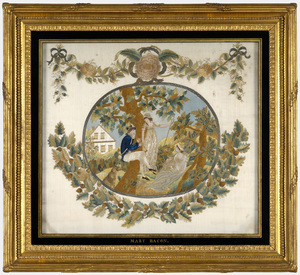 Sarah Pierce of Litchfield built a career for herself instead of marrying, founding the Litchfield Female Academy in 1792 (See Figure 1). Tapping Reeve, founder of the first law school in the United States in Litchfield, indicated that men encouraged a kind of independence for women; he wrote a letter to Maria Tallmadge supporting her decision to break off an engagement with one of his law students. Daughters of the Revolution also grew up to believe that their sphere, though different and separate, was equally important to men’s. Two paintings of Litchfield residents Mary Floyd Tallmadge and Benjamin Tallmadge commissioned simultaneously reflect this perfectly. 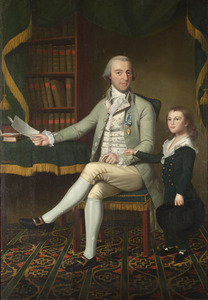 Benjamin is depicted with an older son in one painting with papers and books, suggesting a public career (See Figure 2). Mary is shown in another with her younger children, bathed in light, with a church steeple seen through the window, indicating her moral significance to their development (See Figure 3). Their children were educated at the Litchfield Law School and Litchfield Female Academy. 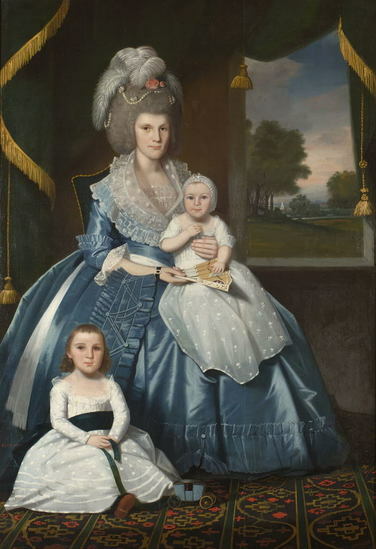 Motherhood took on a political function after the American Revolution. 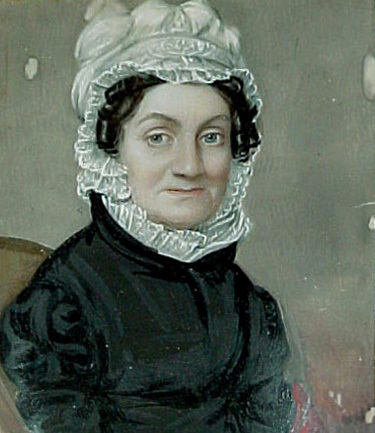 “Republican Mothers” like Mary Floyd Tallmadge were responsible for raising their sons to be full citizens, future voters, and statesmen and for raising their daughters to be self-reliant, virtuous, domestic professionals who would best serve the nation by raising the next competent generation. In order to be the Republican Mothers that the nation needed, an old-fashioned education for women in basic literacy, work habits, needlework, and dancing would not suffice. Sarah Pierce was one of the new nation’s pioneers in female education. Prior to the American Revolution, the best education that girls might have received typically involved no more than rudimentary literacy and ornamental crafts. After the Revolution, Pierce and others opened schools – actual institutions – that offered much more in order to develop ideal Republican Mothers. The emphasis on domesticity and behavior kept the institutions from being too radical; Pierce advertised the prospects of suitable marriages to law school students, and she did not eliminate the more traditional subjects that upper class women were still expected to master. Many examples of her students’ artwork survive (See Figure 4). However, an expanded curriculum reflected Pierce’s goals of self-improvement and intellectual development for the good of the nation. Benjamin Tallmadge promoted the Litchfield Female Academy in a letter in 1823 to an acquaintance who was considering enrolling his daughter. 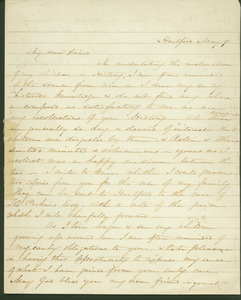 He shared that tuition was $5 per quarter for “art Geography, Grammar, ancient & modern history, Composition, Philosophy, Chemistry, Logic, reading, writing, spelling and needle work.” Pierce was so much on the cutting edge in offering these subjects of study to girls that she could not find a suitable history textbook; therefore, she wrote one herself. The influential author Harriet Beecher Stowe, a native of Litchfield and former student of Pierce, commended her on this textbook years later and asked to purchase a copy to use to instruct her own children (See Figure 5). Although societal expectations still kept women and girls from the public sphere, expanded educational opportunities like those offered by Sarah Pierce prepared them to make valued contributions to their families and the nation. As many as two thousand girls from across the nation and abroad attended the Litchfield Female Academy in its forty years. Some went on to raise their children quietly as good Republican Mothers; some married Litchfield Law School students and supported their husbands’ public careers; and some became educators, authors, and leaders of reform movements, pushing the boundaries of the domestic sphere. Litchfield was one of the catalysts of these large and small revolutions. Norton, Mary Beth. Liberty’s Daughters: The Revolutionary Experience of American Women, 1750-1800. Ithaca, New York: Cornell University Press, 1996. Vanderpoel, Emily Noyes. Chronicles of a Pioneer School from 1792 to 1833, Being the History of Miss Sarah Pierce and Her Litchfield School. Cambridge, MA: The University Press, 1903.